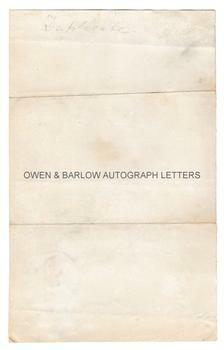 ADAM SEDGWICK autograph letter Signed. British (English) geologist. One of the founders of the modern science of geology. Named the Cambrian and Devonian ages. ALS. 1p. January 6th [no year]. To "Dear Sir". "Pray do me the favour to meet Sir E. Parry on Monday at six - I literally had not a moment to spare for writing up my notes yesterday. Very truly yours, A. Sedgwick." 8vo. Approx 7.25 x 4.5 inches (18 x 11.5 cms). Old folds. Small portrait of Adam Sedgwick affixed to lower right corner. In very good condition. Adam Sedgwick was an important figure in the early development of the science of geology and was a mentor to the young Charles Darwin in his study of this subject. 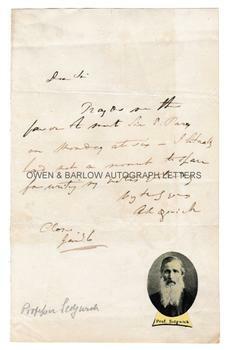 Darwin was a student under Sedgwick in 1831 and accompanied him on field trips. Although Adam Sedgwick defended the science of geology against the more conservative churchmen of the time, he was not a supporter of Darwin's theory of evolution.